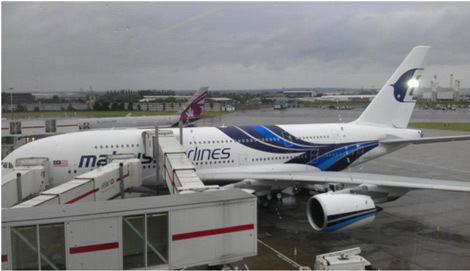 Malaysia Airlines has launched its first Airbus A380 service between London Heathrow and Kuala Lumpur. Arriving into London Heathrow from KL International Airport (KLIA) as flight MH002 early this morning, the aircraft will depart the UK at 1200 BST on MH003. Business Traveller was at the launch event, and is flying on the inaugural service back to Kuala Lumpur. A Tried and Tested report will be published in the September print edition, and Business Traveller will post images from the inaugural service on this site in due course. Prior to the flight, a wet London Heathrow was enlivened by a speech by Malaysia Airlines’ Group CEO Ahmad Jauhari Yahya, who highlighted the airline’s commitment to the London Heathrow – KLIA route, emphasising that the airline had flown the route since 1974. The new A380 has what Malaysia Airlines claims are the widest seats of any first class cabin in the sky at 40 inches, while both first and business class passengers benefit from a pre-ordering ‘Chef-on-Call’ service. To view a seat plan of the aircraft click here. The A380 has a capacity of 494 seats, comprising of 350 economy and eight fully-flat first-class seats on the main (lower) deck, and 66 fully-flat business-class and 70 economy seats on the upper deck, providing some of the most spacious cabins in the skies. (The new interiors have been designed by leading aviation design consultancy, Priestmangoode.) 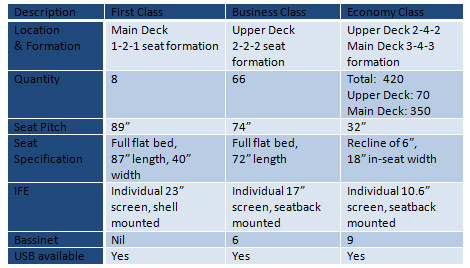 Further stats regarding the seats and IFE screens can be seen in the table below. the recent refurbishment of Malaysia Airlines’ Golden Lounge at Heathrow’s Terminal 4 for Business and First Class passengers as well as the Gold and Platinum category members of its Enrich Frequent Flyer programme. Malaysia Airlines is the only airline to offer a non-stop service between the UK and Malaysia, currently flying 14 times a week between London Heathrow and KLIA, with immediate onward connections to South East Asia, Australia and New Zealand. The new A380 service will initially serve the route with a thrice-weekly non-stop service, increasing to a daily service from the end of August 2012 following the delivery of the second of six A380 superjumbos that Malaysia Airlines currently has on order with Airbus, all powered by Rolls-Royce Trent 900 engines.